The first Egyptian-Chinese archaeological expedition began its work at the Monto Temple in the Karnak archaeological area of ​​Luxor in order to renovate, develop and document the temple, said Secretary General of the Supreme Council of Antiquities Mostafa al-Waziry. During his tour at the temple, Waziry said the expedition first began its work in November 2018 by clearing the weeds and debris. According to Waziry, a French expedition carried out archaeological excavations at the temple area in 1940 in an attempt to discover the rest of the temple. 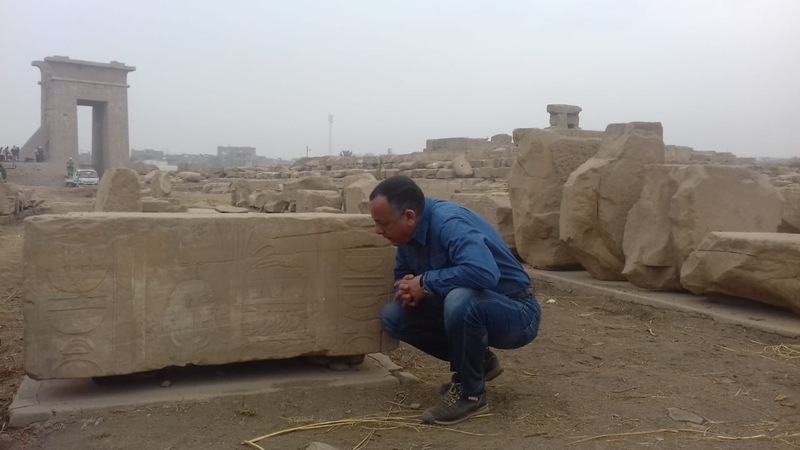 The mission carried out a survey of the temple area, as well as a photoscan and photogramatic of its blocks, which are scattered on the land of the temple since its discovery, in preparation for recording and documenting these blocks, said Mostafa al-Sagheer, director general of Karnak Antiquities and deputy head of Egyptian-Chinese archaeological mission. The Monto Temple is located north of the Karnak Temple and is dedicated to the worship of the god of war Monto. It was discovered during the excavations of French archaeologist Fernand Besson in 1925. Several rulers and Pharaohs over the ages, including the Ptolemaic and Roman era rulers, contributed to the building of the temple, which consists of a tower, a large courtyard, and compartments dating back to the 25th and 26th dynasties of Egypt. It also has a gate dating to the period of Ptolemy III and IV.